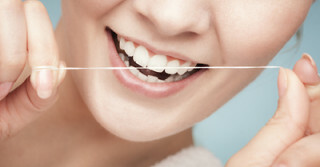 To learn more about how chewing Xylitol can benefit your oral health, or for suggestions about which Xylitol products to use, give our Austin dental office a call today. Welcoming patients from Austin, Westlake, and Cedar Park. Cut delicate foods: Floss is thin and strong and works to slice delicate cheeses, rolls of cookie dough, or other foods that might squish when a knife is pushed into them. Sew on a lost button: When your sewing kit isn’t nearby, floss works as super strong thread. Bundle kindling to light a fire: Because waxed floss burns like the wick of a candle, it is the perfect firestarter. Wrap it on a pinecone, tie up kindling, or twist it around a newspaper roll and light it like a candle. Your fire will be burning bright in no time. Stop an annoying drip: Have you ever spend a sleepless night because of a dripping faucet? Tie some sanitary floss around the spigot to direct the droplets down the string and into the drain. No more dripping! Decorate your house: Use floss instead of wire to hang pictures to protect your wall. String a popcorn garland without worry of germs. Repair a wind chime. And tie up drooping plants. Make an emergency hair tie: A bad hair moment can strike at anytime. Grab a piece of floss and tame your unruly tresses. Do you have any awesome floss hacks? Share them with us at your next appointment. We all love helpful hints. Call my Austin dental office and schedule a visit!